Something that came up several times in the past few weeks has been how to help the server grow further, or how donations work. I thought I'd take some time to clear this up. There are a variety of ways that you can help this site and server to grow. Most notably, talk about it! The more players we have, the more active the community is, the more attractive it becomes for new players. I've assembled a list of ways that anyone can easily assist with. For those who might consider donating money, I've written a more complete explanation on what the money will be used for. In short, there's no pressure to donate whatsoever, as the server won't be going away even if no one does it. However, that can help cover costs and allow further expansions, and is a great way to show your appreciation. I also added a few perks for donators, which are listed on the help page. Most notably, donators will be able to join the server even if it's full and get a special tag in-game and on the forums. Note that, as of now, all staff members also have the ability to join the server even at capacity. That way, potential help won't get locked behind a closed door! With the addition of this information, plus previous additions done to the website in the previous months, I've reorganized the navigation menu a bit. All previously linked pages are now available through some dropdown menus, making sure that entire sections don't get forgotten once their related news post is off the front page! We now have an official Creeper's Lab texture pack! Designed by our own Sphenicus, this pack aims to improve the default Minecraft experience while personalizing it to better fit the server's community. In order to reach that goal, the standard block and item textures have been kept: the look of the core game is thus preserved... yet several changes have been performed. You can read the full details on the download page. Get it today! ... aaand they are done. Hot on the trail of the discovery of the elusive achievement #100, and still pumped from the hunt, our players kept on busy working through the latest set of 50. Less than a week after those were added, Anonymous_SoFar topped the leaderboard by finding and scoring them all already! Good job, Anon! 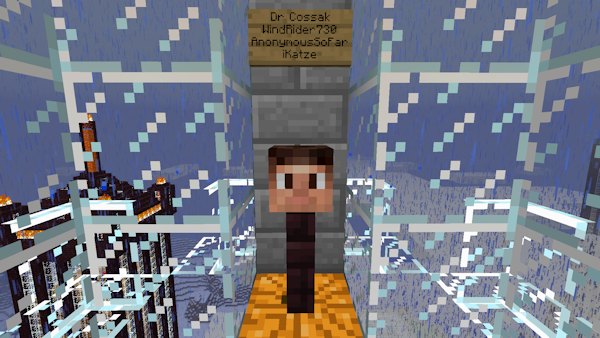 The people requested, the admin obliged! By popular request, 50 new achievements have been added tonight, giving players 150 different goals to reach in-game! 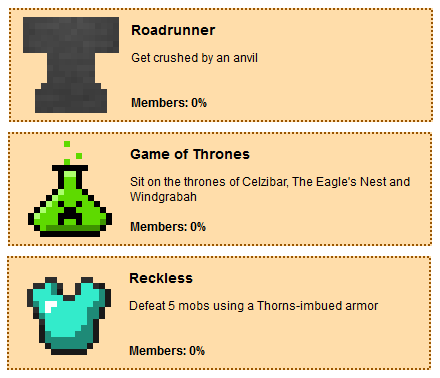 I have done some improvements to the achievements system, allowing me to create some more complex targets. You can view the list of known achievements here, while some of the new entries will be hidden until the moment they are discovered. As before, the new achievements will be granted once you login to the server. This means that the in-game notifications will be fairly overloaded for a few days! Also, almost all of the "visits"-type goals (marked with the Creeper's Lab logo) only count as of NOW, so you'll have to get moving to earn these! It's time to update, everyone: the server is now running Minecraft 1.6.2! Note that you need to download a new launcher to be able to use the latest game version. You can find the download link near the bottom of this news post. Once the new launcher is installed on your computer, I suggest that you click the "Edit profile" buttton and select "release 1.6.2" as the "Use version" setting. That way, whenever the client gets an automatic update, you won't have to go switch back your settings until the server is compatible. To make it easier for you to find horses, I'll be spawning some in the existing plains of the map. This means that you do NOT need to visit unexplored regions of the world to be able to find them! Likewise, each plain will have a chest or two on it. Inside, you'll find various horse armor sets and nametags. It's probably a good idea to store your horse armor and saddles properly in a locked chest whenever you don'tt use them, as anyone can unequip a horse that you've tamed. Also, a newly bred horse will be wild: anyone can tame the baby once it has grown. Use this to give horses to others! After a few months of teasing, the last missing achievement was found! mormonmoo was the first to piece together the clues given to learn about "Race Master - Craft a stack of carrots on sticks". Both Anonymous_SoFar and WindRider739, who had been fighting for the first place on the leaderboard for a while now, both jumped on the discovery and completed their collection of achievements at the same time. Congratulations! Since people keep asking for more, I'm happy to announce that 50 more achievements will be added! I'm aiming to have these available in a bit over a week from now. First things first, I'd like to remind all players, new and old alike, that Saturday nights are Events Nights! Starting at around 9pm (Eastern Time) and lasting a few hours, this special period is designated for players to visit various attractions and participate in group events. 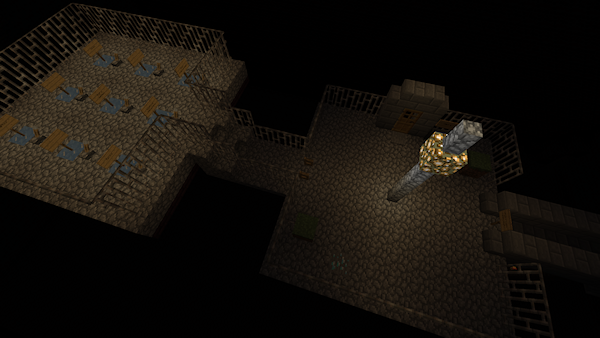 To make this easier, a set of teleporters is enabled at various key points on the map. Losses upon death are also negated: anyone who dies won't lose any items or experience, making PvP battles much easier to participate in. To answer a common question, I've compiled a list of games and events that are available on the server. Note that all these are accessible and working at any time, day or night, all week long. They simply are more convenient to visit on Events Nights thanks to the network of teleporters available and the fact that many players want to participate at the same time. If you're wondering what to do at any given time, check the list and pick a destination! Added last week and successfully tested during last Events Night are head drops. Whenever you kill someone in PvP, they'll drop a head for you to collect. You're then free to hoard these, put them over your own head, or proudly display them on pikes in your trophy room. Additionally, notifications will be published in-game for all to see whenever a player manages to score several kills in a row. This is a quick message to let everyone know that SoratheEliteOne has been added to the staff as Helper. He'll be responsible for greeting new players, helping them find their way around, and assist anyone else who might need it.